A Beach Bash is not complete without delicious food prepared ahead of time but cooked and eaten by the fire. We have included the recipes from our seaside feast below for your enjoyment. They can of course be used for any occasion. Use a powerful blender to make the nut milk or buy premade. Cook gently in saucepan on stovetop, whisking to keep from sticking to bottom of pan, until thickened slightly and temp reaches 80C. 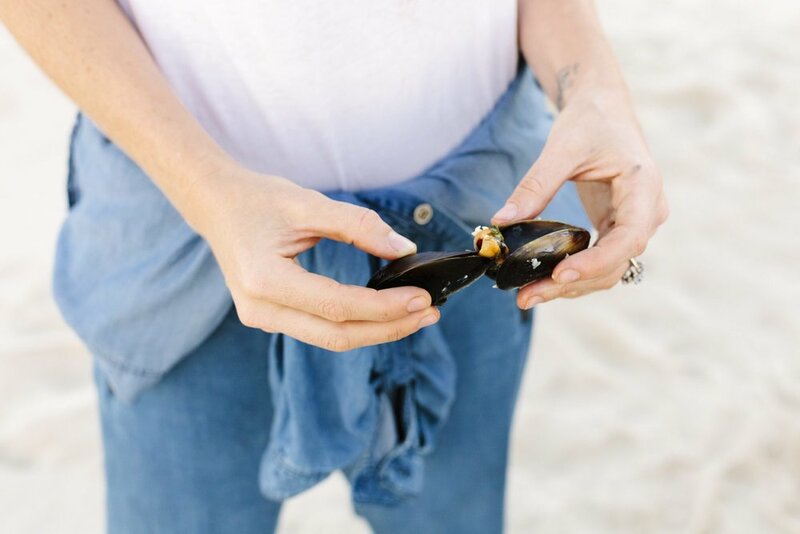 how to eat mussels on the beach: use the shell as tongs & pull one out with the other! In a large cooking pot pour olive oil over the entire base until it’s about 5mm deep. Once hot, add the onion, garlic, bacon bits and parsley stem and cook until translucent and slightly brown and the pan is sizzling. Add the white wine and allow to bubble, then pour over the cream and stir through Once the sauce is hot again add the mussels and pipis. keep stirring until the majority have opened. Add the parsley leaves, salt, pepper and discard un-opened pipi’s/mussels. Serve immediately with crusty bread and butter for a snack or over pasta for a main. Mix the salt with the flour and pour in the beer Mix it goood while doing a little dance Knead it until it’s smooth and dough-like Roll the dough into oval shaped balls and thread onto a stick Roast over an open flame for 8-12 minutes. Pull off and cover with butter, dipped in golden syrup… enjoy!